Ah, Goodison Park, we haven't been there for a while now, have we? Some might say that for most of the games we've played against the Toffees at their home ground, our team haven't turned up either. 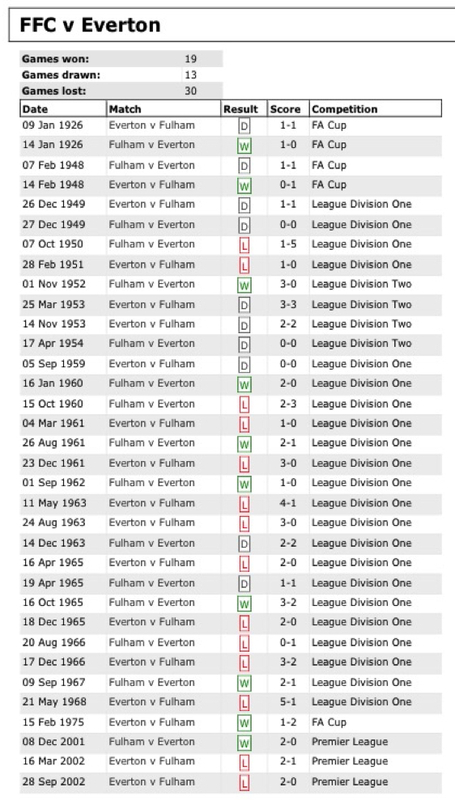 The horrible truth is that we've never beaten Everton at their home ground. 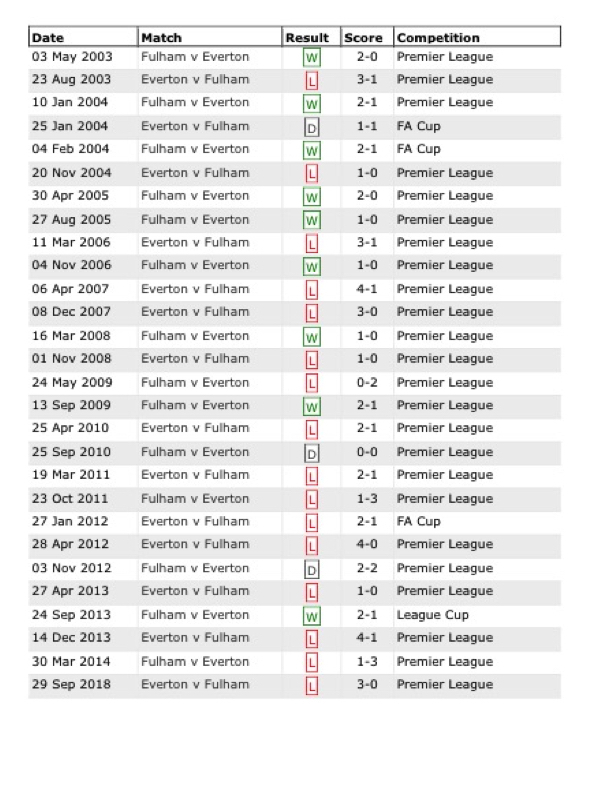 The Fulham site states that we have lost every game in the top flight at Goodison, this actually points to the fact that Everton are one of the Premier League clubs that have never been relegated. I believe that they are the only team to have this record although there are others that have been ever-present in the Premier League, which was formed in 1992. We weren't looking too bad in a drab first half and missed a couple of chances but we weren't looking likely to overturn our rotten run of results in the league at Goodison Park. Oddly, we have in fact beaten the Toffees at their home ground once, on the way to the 1975 Cup Final. They were top of the old First Division and we were midday up (or down) the old Second Division at the time and it caused a major upset everywhere (except in SW6). In this latest visit, we lost Fosu-Mnsah very early on after he made a tackle, injurying himself. In my mind, he's one of many that still has something to prove so it was a shame his game ended prematurely, Christie replaced him of whom probably, much the same could be said. At 0-0 when the second half whistle blew for kick-off we were halfway there, a draw would be rather welcome come the final whistle, I foolishly (or Fulhamishly?) thought. 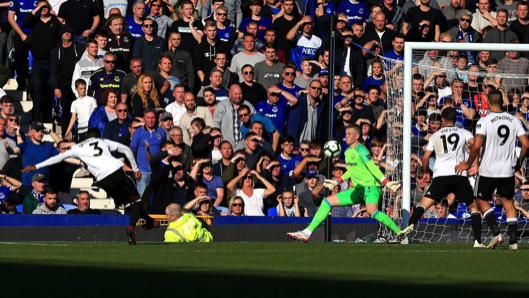 Alas, Everton had other ideas and started pushing us back, Richarlison coming close before in the 50th minute Denis meanaced Calvert-Lewin in the area and the ref awarded a soft penalty, luclkily a beaten Bettinelli watched Sigurdsson's attempted conversion cannon off the bar, maybe it could turn out to be our day in the Blue half of Liverpool at last! Sadly it all went pear shaped and we were back to normal, Mitro was hardly seeing the ball, Seesgnon tried as hard as he could and swivelled, dribbled but just couldn't convert or feed others effectively. Vietto, again, looked great running forward with the ball but panicked when it mattered near the goal. Then seven minutes after his penalty miss, Sigurdsson made amends and scored, it ought to have been prevented but right now our defence is probably incapable of kicking a hole in a wet paper bag, even Tim Ream is showing signs of needing more games to get himself back to100%. It only took another nine minutes for things to become twice as bad, Walcott feeding a ball in for Tosun to nut into the net. Sugurdsson then got his second goal three minutes from the end of normal time, we were dead and buried by then. 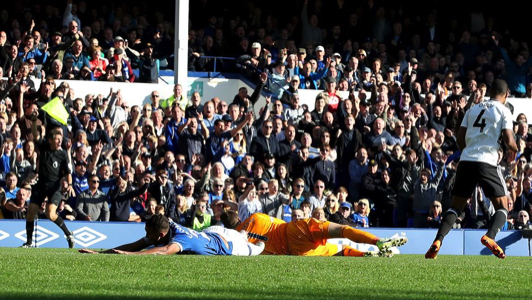 A typical day out for the Whites at Goodison Park then! heavily loaded in Everton's favour, we have thirteen victories to their 29 (30 after this one), so there's room for improvement there then, let's hope we have a long enough run in the Premier League to make those stats look more respectable. So what can we hope for on the 29th? Obviously we'd rather like 3 points but, honesty being the best policy, a draw would be pretty agreeable, I'm not holding my breath.